What would you do if you found a loved one unresponsive? What are the signs and symptoms of a heart attack? When should you call 911? Get the answers to these questions and more during this Emergency Awareness Workshop! 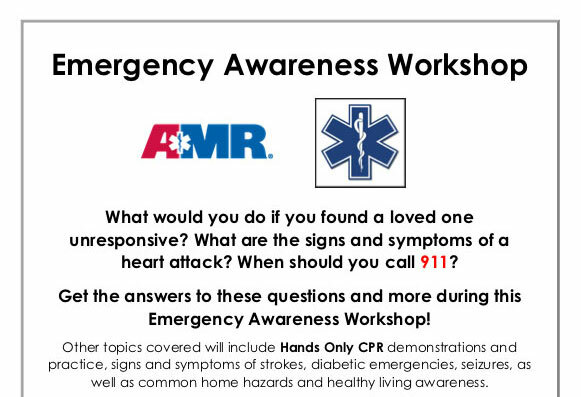 Other topics covered will include Hands Only CPR demonstrations and practice, signs and symptoms of strokes, diabetic emergencies, seizures, as well as common home hazards and healthy living awareness. About the presenter: Jill Vincent has over fifteen years of experience in Emergency Medical Services. She has worked as an EMT, Paramedic, Critical Care Paramedic, Preceptor, Supervisor, and educator throughout California. Currently she is an Operations Supervisor and Quick Response Paramedic for American Medical Response / Sonoma Life Support based out of Santa Rosa.